Extended Tacoma Link hours for the George Strait concert on Saturday. Mayor Murray says West Seattle deserves some kind of rapid transit before Sound Transit gets there. Architect developing a concept for Seattle’s tallest tower. Angst over Bellevue College growth and Eastgate redevelopment. New buildings on First Hill. Plans for almost 2,000 new units in South Lake Union; not nearly enough. The inability of some people to comprehend (or care) that others would like to live differently is astounding. Fix design review before expanding its scope. A look at minimum density rules. One man is trying to standardize the world’s subway maps. Prop 1 Endorsements from cities of Shoreline, Sammamish, Kirkland, Federal Way, and Des Moines. Everett discusses how light rail will get there. Pierce Transit restores Puyallup Fair service, cancels the “custom bus” to Olympia. The resulting analysis is sketchy, but it’s interesting that more than 100% of 2013’s increase in U.S. transit ridership came from New York City. Tacoma offering small grants for bike-friendly businesses. Rainier Valley walk signals will get longer. Anger at new development’s effect on affordability is wildly misplaced. Architecture students develop visions for Rainier Beach. A comparison of the Portland and Seattle approaches to light rail design. Pierce Transit fires its public safety chief. Dexter Ave. may get 65 more affordable units. Seattle Council looking to make small-lot zoning worse. The problem is where do you connect it to? Avoiding the viaduct is the goal I presume? Also, if we are addressing West Seattle, are we still leaving Ballard as is? Could be build quickly and fairly cheaply. My idea would be to go from around the junction to SODO station. Good bus connections on the West Seattle side should easily handle capactiy for the next few decades. Plus will be a great tourist draw for West Seattle. My idea would be to go from the Junction, to the Admiral District, to Aliki Beach, then straight across the bay to downtown. That’d be an even greater tourist draw, as well as providing much better transit connections to the Admiral District. The problem West Seattle has is that it is population is spead over a fairly large region. This can be addressed much better by buses than by a gondola which is much more location sensitive. I suspect either a new transit only bridge or dedicated transit ramps and lanes on the existing infrastructure would be a better near term solution. I agree with Charles. I love gondolas, but I think the area is to broad. I also think the distance from West Seattle to downtown, or even to the SODO station is just too far for a Gondola to make sense (especially since we already have a freeway for much of that distance). On the other hand, a gondola from South Seattle Community college to 99 could make a lot of sense. That is pretty short, but rather cumbersome right now (driving takes about ten minutes). A gondola ride to a station at 99 could make life a lot easier for a lot of people (coming from either direction). But I understand why he said that, and have no problem with it. He is a politician, after all. Anyway, speaking of which, this is where he could rally earn his salary if he managed to use his experience with the state in including this sort of work in a transportation bill (if we ever get one). The state likes to build roads, and this would all be roads. I don’t care if the roads are car pool/transit — they are still roads (and the legislature had no problem building these kind of roads). But this sort of thing would make a huge difference for the folks in West Seattle. It could give them “Real BRT” in the short run, and who knows, maybe a rail line in the long term (if it is ever justified). The state wouldn’t pay for all of it (of course) but if it ponied up for a lot of the ramps and extra lanes, it would make the cities share of it a lot cheaper. A relatively low-cost project to speed up West Seattle buses (C, 120 & 125) would be to widen the ramps from the West Seattle bridge to 99 to allow a bus lane. For the inbound commute, the bus lane across the West Seattle bridge is great, and the bus lane segment on 99 is great. But between them, buses must merge into a single lane for the loop ramp to 99 northbound, killing at least 5 minutes everyday. There is a reverse effect in the afternoon on the leadup to the southbound 99 to West Seattle bridge ramp. It is perhaps the biggest technical challenge. The Ship Canal already has several bridges, and the Link tunnel is done, it’s just waiting for the stations to catch up. West Seattle has not only the Duwamish Waterway but a steep hill west of it, and further steel hills all across West Seattle. All these hills and waterways chop up West Seattle (and south Seattle) into small narrow residential islands, which hinders the development of inter-island commerce, transit, and social contacts. I agree Chad. That, plus some other widening, plus a ramp to a SODO station, and the whole thing wouldn’t cost that much. It would several billion dollars cheaper than rail, and just as fast. You really can’t say that about most of our system (e. g. Ballard to the UW). Also Chad, your suggestion is number five, on my list (expansion of the cloverleaf). The items are not in priority order. Another mention of the SODO Station Transit Center?!? I’m completely in favor! Once the buses are kicked out of the tunnel, Metro will have to consolidate travel through downtown on fewer vehicles. SODO Station would be a great place to turnback some of the routes coming from the south end and consolidate riders onto higher capacity vehicles. With 4 car Link trains running through SODO Station every 10 minutes (or better) and if the RapidRide buses to Ballard and Aurora terminated at SODO Station, there would be plenty of frequent capacity to serve downtown from SODO. A ramp off 99 to SODO would also be helpful. SODO Station to the Admiral District or SSCC would only be a few minutes away. A transfer at SODO might not look so bad if you’re talking about waiting 2 minutes for a bus during the daytime. But waiting 10 minutes for a bus there at night (when everything runs less frequently) is going to be a nonstarter for a lot of people. ＠GuyOnBeaconHill Wait, doesn’t the Rapid Ride from Ballard go to West Seattle as the C? Why would we want to terminate that line in SODO? Once the buses are kicked out of the tunnel many riders will have the choice of (a) transferring from Link at another station to their connecting bus, or (b) enduring horrendous traffic delays in downtown Seattle. There’s been a lot of talk about terminating routes at Rainier Beach Station, but forcing transfers at RBS has 2 big problems: (1) most buses can get from the Boeing Access Road to SODO Station faster via I-5 than Link can and (2) RBS is a horrible place to transfer. If you think riders will balk at transferring at SODO, imagine the rebellion against RBS. The key to making SODO Station work a transfer point is having plenty of frequent options to get riders to their final destination. Terminating RRs there would add more capacity and offer more destinations (Belltown/LQA). And when I say that Metro should create a SODO Transfer Station, I don’t mean a Mt. Baker Station-style layout with dismal platforms and asphalt bus bays. SODO needs to be upgraded with covered, sheltered, lighted waiting areas and real-time arrivals/departure information. It needs to be the kind of place where a 10 minute wait won’t be unpleasant or feel dangerous. I’ve often wondered if we could max out Link’s frequency in the pre-North Link, rail-only DSTT between 2019 and 2021 by running two lines, UW-Angle Lake and UW-Sodo. 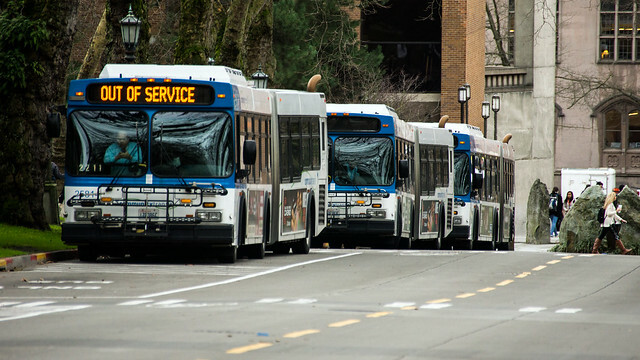 Not only would it boost frequency between UW-Capitol Hill-Downtown to every 3-4 minutes, but I think that would be a decent forced transfer for the 101, 102, 150, 177, 178, 190, 590, 594, 595, and maybe others like the 577/578/592. You could use the added savings to boost frequency on all those routes, and you could free up the massive layover space on Eastlake that ST/PT currently use. I seem to be the only one interested in the idea, so maybe it’s crazy. :) I just think it’s a waste to have a rail-only DSTT for 3 years, but only be running every 7-10 minutes. It would be difficult to have a turnback at SODO Station. There’s a pocket track at Stadium Station, so that might be a better place for your transfer station. @Zach: there’s no turnback track at SODO, but there might be possible to turnback trains at the O&M facility. In the end we need 1) a bridge across the Duwamish and 2) better downtown access from the south. Ideally those should both come from building rail. If rail is just not possible then it will have to be BRT. But with BRT, the bus won’t even really be helped by a new bridge — mostly, a new bridge would allow for more car traffic on the existing bridge. So I’d skip the new bridge until rail became an option. The focus for BRT would have to be on the downtown end. Dedicated lanes all the way up 99 to the Atlantic Street exit; dedicated lanes along Alaskan Way to Columbia; a bus-only contraflow lane on Columbia; and a dedicated lane westbound on Columbia would do it. If the mayor is willing to do what it takes to actually make Rapid Ride D/E into a real BRT I would be in favor of that. If additional transit lanes aren’t necessary then that makes the choice even more obvious (I assumed they were because they don’t go all the way from West Seattle to 99 northbound). Just build a ramp from 99 to a SODO station (item 4) and add the rest of the “Real BRT” improvements (off board payment stations). That would be sufficient, no? Item number 6 (tunneling under West Seattle) might be necessary, but maybe not. I don’t know enough about the bottlenecks to be sure. My guess is that if a rider manages to get from the start of the West Seattle freeway to the Sodo station and onto link in less than five minutes, then we are OK. If the new bridge is transit only, wouldn’t it at least only help those who are using public transit, e.g., Rapid Ride and various Express buses, since the buses won’t sit behind cars merging and moving slowly behind others. If we can get rail that would be great, but considering how expensive price tags for mass transit infrastructure improvements tend to scare off many residents and politicians in our so-called progressive city from supporting them, lets, at the very least, fight for an additional bridge for rapid bus transit. A bottleneck of sorts that a separate bus only bridge could not prevent is a pile up of traffic along Avalon Way and 35th Ave SW if there is an accident on the WSB since the bus lines must travel down those main drags to get to the Bridge (and possibly an additional bridge). I just read the “Angst over Bellevue College growth and Eastgate redevelopment” article. It turns out that the “angst” is just people living in SFH neighborhoods near Bellevue College noticing perfectly good nearby homes being torn down and replaced with large, utilitarian structures that are serving as informal college dorms. Concerned neighbors even found ads on Craigslist targeting international students to rent rooms in these giant rooming houses. I’m with the homeowners. Surrounding neighborhoods shouldn’t have to pay the price because BC can’t or won’t address their student housing shortage. Student housing shortage? Bellevue College is a commuter college. Some of their students appear to want a short commute. How would you expect BC to address a housing shortage without building nearby housing? There are no multifamily-zoned housing areas of any sort anywhere close to BC. Not true, there is a multifamily zoned property contiguous to BC, both east and to the west. Not to mention the multifamily housing all along 140th from BC to approximately BelRed road; Factoria; Richards Valley; and Eastgate proper. All as close, if not closer, than Spiritridge. How about BC does its part to create efficient streets and bus stops to allow efficient transit service. Maybe then it would be more viable for students to live elsewhere. Right now the buses spend too much time meandering their campus and then the stops aren’t in attractive locations. The campus could be designed way better for transit access. But that would reduce the value of lucrative parking permits! Carl, what’s more efficient than having on-campus international student housing at Bellevue College? Then those students could simply walk to school, and perfectly good homes wouldn’t have to be torn down to be replaced by giant rooming houses in single family home neighborhoods just far enough away that those students have to rely on public transportation to get to school. Think about it. If you’re really all about efficiency, which is the most efficient solution to this problem? The most efficient thing is for the free market to provide the housing in its own, on land that regulation is currently forcing to be single family. Ewww, you sent us to a Cato piece by Rnadall O’Toole. The Cato/O’Toole piece is really stupid. Quote: It turns out that all of the increase in transit ridership took place in New York City. Some cities had increases and others had decreases. One of the biggest reasons that some cities had decreases is that many transit systems have cut service in the last few years. Less service leads to fewer riders. More drivel: Since most of those federal dollars come out of gas taxes, auto drivers are being forced to subsidize rail contractors, often to the detriment of low-income transit riders whose bus services are cut in order to pay for rail lines into high-income neighborhoods. Is Cato going to try to tell me that Rainier Valley was a “high-income neighborhood” prior to Link’s arrival? I agree, 99% of his conclusions are ridiculous. Nevertheless, I agree that the “ridership is up nationwide because of all these expansions!” line isn’t really borne out by the data point. If transit investments were proportional to demonstrated need, the Second Avenue Subway would have been done a decade ago and would have been paid for entirely by the federal government. And yet here we are, congratulating (and subsidizing) Houston for accidentally conveying 1.5% of its urban population somewhere between spectacular turn-lane SUV crashes. Oh, wait. 0.75% of Houston’s urban population. I forgot to divide by “round trips”. He argues that the high costs of rail necessitate cuts in bus service which of course causes decreases in ridership because rail is more expensive to operate. Are rail-based systems that much more to operate and the source of bus route cuts? According to this article (and table at bottom) operational cost per hour of light rail is twice that of buses. He claims that the cost differentials are from: track, stations, and electricity costs. We already have the per-passenger costs for Metro and Link so we don’t have to go to theoretical estimates. I don’t have the numbers but I believe Link is close to Metro if not below, and it will continue going down as the extensions are opened. Link’s fare is already below Metro’s for trips up to 10 miles (Westlake – Rainier Beach), and for longer trips it more accurately reflects the cost of service (while Metro’s is arguably flatter). MacKechnie says a 3-car train every 10 minutes has the capacity of a bus every 2 minutes. Link is planning to run 4-car trains every 4-5 minutes between Intl Dist and Northgate, so that’s 2 1/2 times MacKechnie’s baseline, or a bus every 48 seconds. ST claims that halving that frequency (without East Link or shuttles) would be overcrowded. The first thing that’s clear is that different segments perform differently. Westlake – SeaTac is doing fine at 2-car trains every 8-10 minutes; it will go up to 4-car trains but probably not increase frequency, and the Eastside will be the same as that. So the cost per passenger is clearly higher for a SeaTac passenger than a UW-downtown passenger. So the most cost-effective Link segment is downtown-Northgate, and some people think we should have stopped there (and then built a Ballard spur). It’s a continuum: the more you extend it to lower-density areas, the higher the cost per passenger in those areas. So where do you stop? Some people say Lynnwood and Des Moines; others say Everett and Tacoma. But all these segments work together, not in isolation. If the trains fill up in the periphery, they can’t serve the middle because they’d be full. So you have to measure capacity in the middle, not at the ends. MacKechnie’s estimates really only apply to a line with the baseline ridership in the middle. That would be like the current Link starter line, or MAX’s Banfield segment (three lines combining for 5-minute service with 2-car trains). Natural gas costs are the biggest thing in MacKechnie’s favor, because the petroleum vs electricity comparisons were done before the shale gas boom. But the switch to (wired) electricity is partly for a long-term benefit. Electricity can be generated in dozens of ways, including natural gas, renewables, waste bio-energy, geothermal, etc. Some of these can be fitted into a self-powered vehicle but others cannot. (Electric car, yes. Solar car, maybe someday. Geothermal, no.) Renewable sources will inevitably get cheaper over the decades, and stationary power generation allows us to use whichever mode is cost-effective at the time without changing vehicle engines. As I posted about a week or so ago, of you look at the actual numbers this really doesn’t seem to be the case. It is quite difficult to work with Seattle numbers because Link really doesn’t go that far yet. Here in Portland though, MAX costs about $0.50 per passenger per mile, and the buses more than double that. There are different ways to measure the cost, but the fact is that when a passenger boards they want to go a certain number of miles. Thus, to me, cost per passenger mile seems to be the best comparison to determine if it is less expensive for that person to move by rail or bus or whatever. Right now, for Link, while the airport certainly generates some ridership, it isn’t the downtown of anything. So, don’t be surprised that Link costs somewhere around $1.38 per passenger per mile. SoundTransit’s express buses are quite a bit cheaper, and something around $0.01 cheaper per passenger mile to operate over MAX, but don’t have much in the way of intermediate stations and they actually go city center to city center, so naturally it costs quite a bit less to operate those. Link, however, is cheaper than King County Metro bus routes in general, so anything that moves passengers to light rail is a cost advantage. So, as long as the technology chosen is appropriate for the task, rail can be cheaper than a bus over the same route. Never, ever cite O’Toole unless you’re debunking him. He lies. I’ve looked at the data myself. Rail transit ridership is up in almost all cities. Bus ridership is up in small cities and down in most larger cities. What do you make of that, if you are honest (unlike O’Toole)? John: rail is, in almost all locations, cheaper to operate than buses. As usual, doctored numbers are being used to claim otherwise. Rail is quite expensive to construct upfront, but that’s another matter. Bus service is expensive to run. In big cities, it’s also inefficient because it gets caught in traffic. A bunch of cities cut bus service a lot, due to lowered sales tax receipts or other such things. Therefore bus ridership dropped a lot. In small cities, there wasn’t much to cut and not much was cut; also buses are more effective in small cities due to lack of traffic. Rail service is efficient to run, and so when sales tax receipts (or whatever the other source of income for the transit system was) dropped, it didn’t make sense to cut rail service. Rail ridership therefore continued on its previous trend. Unsurprisingly, ridership is not up on that new rail-caught-in-traffic model that idiot cities now think is the bees’ knees. Well this is good news. I bought a ticket for Sunday’s A’s vs M’s game and looks like Sounder will provide service for the afternoon! Neat. And they will for all scheduled afternoon games. Awesome. There is only one afternoon game scheduled on a non-Sunday. This is the second time STB has linked to that profoundly misguided Portlandia blog post, and thus the second time that the destructive Portlandia fallacy on which the author’s comparison is based — that transit “makes places” in the absence of such other key factors as location, development geometry, or, y’know, the transit actually being effective enough to bring people to that location — needs to be pointed out. At least that blog makes for a pretty good primer on backward PNW transit thinking. Can’t get much more Portlandia than a park and ride lot and station that is easiest to reach by bicycle than any other mode (Bybee Blvd), including attempting to drive or walk to it. errr, make that Tacoma Street. Bybee you can actually walk to. Bybee Blvd isn’t ideal in terms of generating walk-on traffic from the downtown area of Sellwood or Woodstock, but there is at least a fair amount of pedestrian traffic already existing on the bridge. It’s probably about 10 people per hour or so most of the time, but it is at least something. I’ve crossed there a few times as well to get from bus route #10 at 28th and Steele to the restaurants in Sellwood. Since they built the thing some 25 years ago, I have yet to see a single pedestrian cross the Tacoma Street bridge over Highway 99E. That doesn’t mean it is impossible, but it is highly unlikely that anyone wishing to do so will survive the unsignaled entrance / exit ramps to/from Highway 99E. Bybee at least has a traffic light and signaled pedestrian crosswalks in the same location. “•Mayor Murray says West Seattle deserves some kind of rapid transit before Sound Transit gets there.” So the “Rapid” ride doesn’t count? We all know that metro doesn’t do BRT. if you want some of that you’ve got to go to snohomish county. Certainly Mayor Murray and West Seattle don’t think so. But RapidRide C, for all its faults, is better than the previous service. No dropping to 30 or 60 minutes in the evenings, and you can actually get from Alaska Junction to Alki rather than having to take a slower bus from downtown. I’m still baffled by the newer KC Metro Tripplanner. How do I limit the maximum walking distance? Or was that feature removed? It’s not in “Advanced Options”. I’m trying to give the newer Tripplanner a chance, but it’s awful now and I tend just to use the trip planning features in Google Maps, Transit, etc. Yes, Link should be routed by Paine Field with a stop at Boeing’s Everett plant. There are 40,000 people who work there. It would be a bad idea not to serve such a tremedous cluster of jobs, even if it did mean going a bit out of the way to reach it. A spur line would do the job nicely, where the trains were timed to leave the station 30-60 seconds after a train arrived. That’s a shuttle rather than a spur. A shuttle is a small train that runs from a regular station to someplace where the main line doesn’t go. A spur starts from the same origin as the main line and then deviates from it. A spur is extremely unlikely. A shuttle has a better chance but really only if Boeing pays for it. Having a single line swing over to Boeing before Everett would add only a few minutes to the trip, and would affect only those going to/from Everett or further north. It would also give Link service between Everett and Boeing, which a shuttle or spur wouldn’t do. First, by the time Link goes to Boeing, Boeing will probably move out and the station will be worthless. Also, the Boeing campus is not a single point, and is much less walkable than the Microsoft campus. Census data released in March reveal that as Americans start moving around again, cities are seeing a different kind of urban flight. This time, hundreds of thousands of Americans who enjoy city living are abandoning major population centers not for suburbs but for more affordable, second-tier metropolitan areas.